This bedroom is tops on my list of favorites. It makes me excited for Spring, want to buy some of my own orange curtains, and move to a loft with super high ceilings and exposed duct work. Back to work now, boo hiss. Sigh...that bed is calling my name. Oooh-weee - that makes me HAP-PY! Great bedspread! Looks so organic and yummy. i would have to whole heartedly agree. such a pretty, colorful room! Day dreaming is the best, especially when you spend eight hours a day under the fluorescent lighting of a cubicle like I do. I want my own set of floor to ceiling windows! The yellow lamp shades make me happy! Love the whole desk/lamp situation. Hah - the gold paired with the set of yellow lampshades is oh-so-yummy. Great find. Those curtains are amazing. And so is the bed. Can I connect this to Eric Cohler's living room down there?? The one with the green sofa?? I love bedrooms too! They're my favorite room in the house. I am crazy for lofts, too, they are the best "blank canvas" there is. Fabulous post! I want orange curtains, too, now! Love this. love this space... those orange curtains are gorgeous... have a nice weekend! I love to hate rooms like that, just goes to show you that good bones really do make the room. That light and the loftiness are making me light-headed. Excuse me while I lie down on that bed or better yet, have a good and happy jump! I love everything about this bed...its perfect! This picture is so refreshing. I love this space and find myself drawn to citrus colors @ the moment. Just beautiful!! 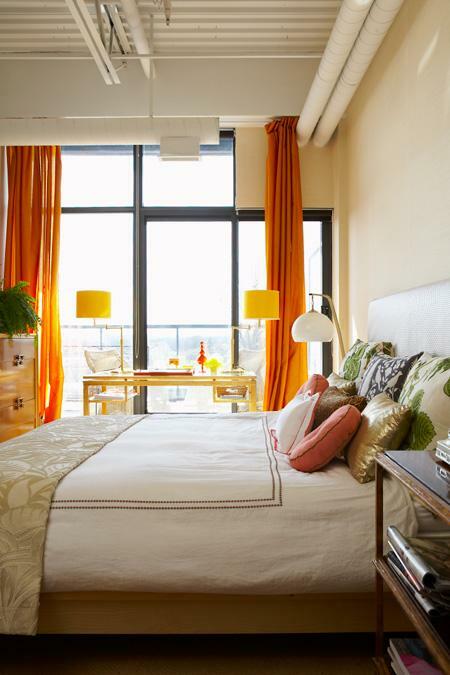 !I really like this bedroom,the orange curtains with the set of yellow lampshades. Unexpected color combo!! it's perfection! Thanks for a wonderful share.